Shaun Gladwell’s video works are predominantly concerned with movement, usually in urban spaces. More recently, however, he has extended his practice into a consideration of landscape and place while retaining his core interest in the movement of bodies through space. A spellbinding sense of quietude permeates his work. ‘Approach to Mundi Mundi’ is part of the ‘MADDESTMAXIMVS’ series – an ongoing body of work that has been presented in various arrangements, including at the 2009 Venice Biennale. 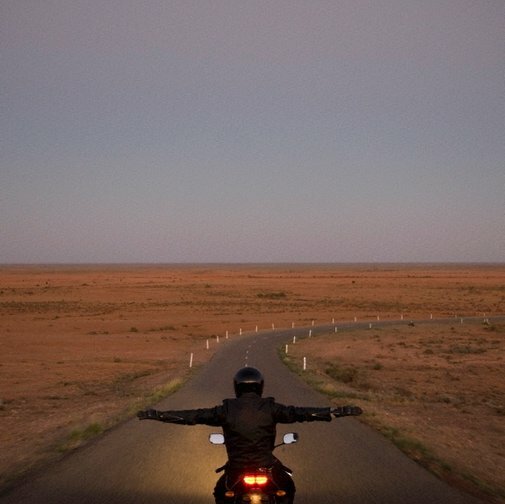 In ‘Approach to Mundi Mundi’ a faceless motorbike rider, clad in black leather, travels along the white lines of a highway descending into a barren Australian desert. The composition is radically divided by an unbroken horizon line and vertically segmented by the rider’s upright Christ-like position. Poised on the bike with outstretched arms, he appears to embrace the land before him, his stillness demonstrating a heightened sense of bodily awareness and concentration. Paradoxically moving yet also still, this work figuratively ‘swallows’ time, presenting a type of extended moment. Signed l.c. certificate of authenticity and on DVD masters, ink "Shaun Gladwell". Not dated. Natasha Bullock, John Kaldor family collection: Art Gallery of New South Wales , 'Shaun Gladwell', pg. 288-89, Sydney, 2011, 288, 289 (colour illus., video still). Rex Butler., Shaun Gladwell , 'The narcissistic image', 2008. Blair French, Australia: 53rd International Art Exhibition, La Biennale di Venezia , 'Maddestmaximvs – planets and stars sequence 2009', pg. 4-5, AUT, 2009, (colour illus., video still). Stephen Hepworth, Shaun Gladwell: perpetual 360° sessions , 'Extracts from the diary of a wanderer', pg. 6-13, Heerlen, 2011, 10, 68-69 (colour illus., video still). Anneke Jaspers, Look , 'Shaun Gladwell', pg. 13, Sydney, Sep 2012, 13. John Kelly, Art Monthly Australia , 'The beauty of distance', pg. 10-13, Canberra, Jul 2009, 10-13. Bruce Millan, The Art Newspaper , 'Australia takes images of outback and Mad Max to Venice', pg. 46, Jun 2009, 46. Wayne Tunnicliffe, Look , 'Kaldor and contemporary', pg. 26-29, Sydney, Apr 2011, 29. Shaun Gladwell: Maddest Maximvs , 2007, 3 (colour illus., video still). Shaun Gladwell: videowork , 2007, 105 (colour illus., video still). Figuring landscapes: artists' moving image from Australia and the U.K , 2007, cover (colour illus., video still), 38 (colour illus., video still).